Researchers from the conservation group Oceanomare Delphis recently made a heartbreaking discovery off the coast of Italy. Two miles from shore, they encountered a bottlenose dolphin supporting the body of her deceased calf, apparently unwilling to leave it behind even after death. "The dolphin was holding up and carrying the lifeless body, trying to keep it afloat," according to a YouTube post from the group. "In the absence of specific information, we suppose that the adult individual was the mother. Near the mother-baby pair there was also another individual, showing an accompanying/supporting behavior." Dolphins aren't the only animals to exhibit mourning behavior at the loss of their young. Much in the same way people do, a variety of species have been observed seeming reluctant to part with loved ones they've lost, suggesting there's little distinction to be made between humankind and animals when it comes to matters of the heart. 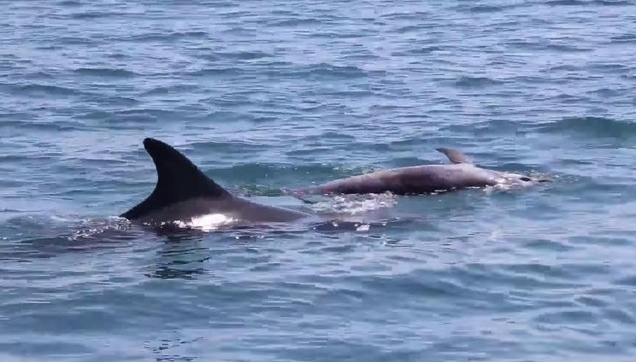 Responses to "Grieving Dolphin Seen Carrying The Body Of Her Lifeless Calf"